It’s the month of LOVE and the time to fall in love with the Island’s promotions and events in February. Read on for all the details. Island Club members visit any kiosk to receive  entry for every 25 points earned on your Island Club card to win up to $500 cash! You don’t need to be present to win but if you are, get dinner on us! Random drawings will be held every half hour WEDNESDAY, THURSDAY and FRIDAY 6 pm – 10 pm EST starting Feb 6. Don’t miss Firekeeper’s and 5 Bridges exclusive Valentine’s Day Menus! Only available on Valentine’s Day February 14, 2019. *Promotion subject to change at management’s discretion. $25-$500 cash drawings. Dinner $50 value. 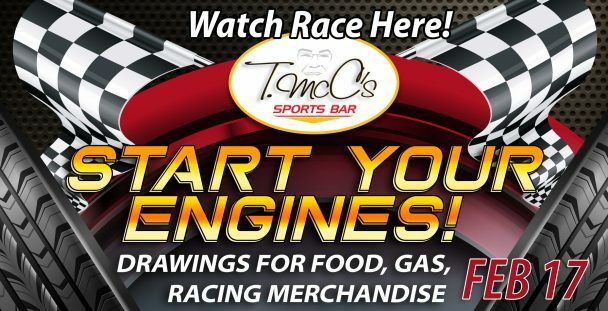 Kick off the 2019 race season with us on February 17 at 2:30 pm EST at T McC’s Sports Bar! Random drawings during the race for food, gas and Nascar.com gift cards. Must be present to win! Just register at any kiosk for race day drawings beginning at 1:00. All drawings will be held at the Island Club and announced in T. McC’s and on the casino floor. Promotion subject to change at management’s discretion. 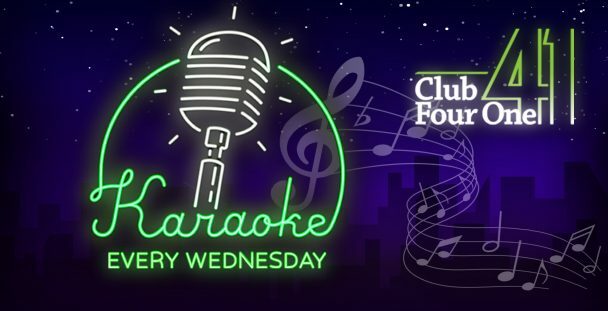 We are excited to announce Karaoke Nights in 2019 every Wednesday through April 24 at Club Four One! We want YOU to be the star of the show so this is your time to shine. Choose from over 11,000 songs or just sit back and watch the show. Admission is FREE! Karaoke Nights run from 7pm – 11pm EST with host Brad Linton AND exclusive drink specials, $2 PBR Draft and $3 Margaritas. Grab a friend or two and join us every Wednesday to sing your heart out! 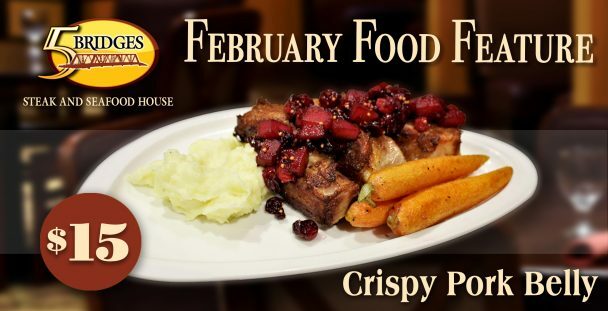 Enjoy a Crispy pork belly cooked sous-vide with cranberry-pear mostrada, Yukon gold puree and baby carrots at 5 Bridges Seafood & Steak House for only $15 available through February! 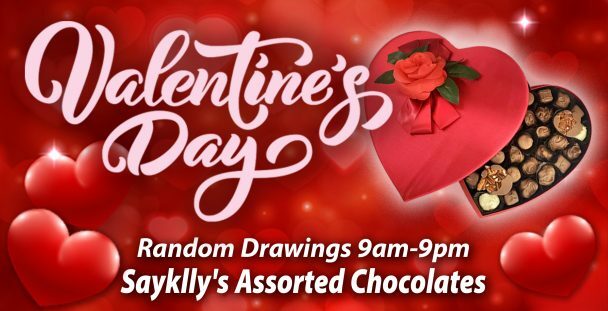 Celebrate Valentine’s Day at the Island with random drawings from 9 am – 9 pm EST on February 14 for  18 oz. Hearts of Sayklly’s Assorted Chocolates. Must be using your Island Club card to be eligible. Promotion subject to change at management’s discretion. 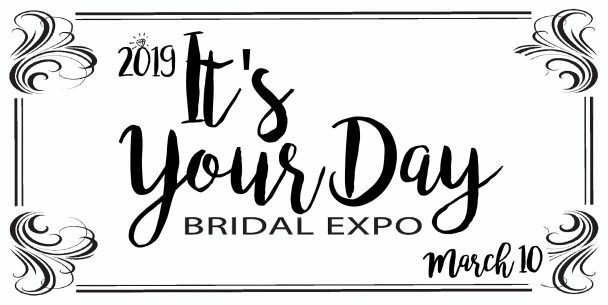 The Island Resort & Casino cordially invites you to attend 2019 It’s Your Day Bridal Expo on Sunday, March 10, 2019 at 11 am – 2 pm EST at the Island Convention Center featuring a Runway Showcase, door prizes, light refreshments, many wedding service vendors and a grand prize (over $2,000 value). Tickets are $10. MUST BE 16 OR OLDER TO ATTEND. For more information and updates, join our Facebook event page. 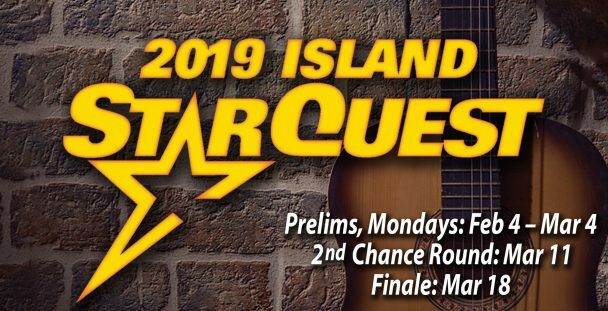 Another year, another quest to find the 2019 Island Star! *Each contestant in a preliminary round will be entered in a drawing for $500 cash. Drawing held at the finale on March 18. Must be 18+. Must be present to win. *Must be 18+ or accompanied by an adult to attend. Dance all night long at Club Four One this winter with the hottest bands from around the country. Click here to see the full 2019 lineup. *Local Bands play Friday & Saturday only. All acts subject to change. Must be 18+ to enter Club Four One. Must be 21+ to consume alcoholic beverages. Residents of Menominee County and Delta County, we invite you to book an appointment for a 50 minute Swedish Massage for only $45 (original $95), Mondays through Thursdays through March 31. Appointments can be made by phone or walk-in* only. Call 844-475-3743. *Walk-in based on availability. Photo ID required for proof of residence upon arrival. May not be combined with any other discount or coupon. Price does not include gratuity. 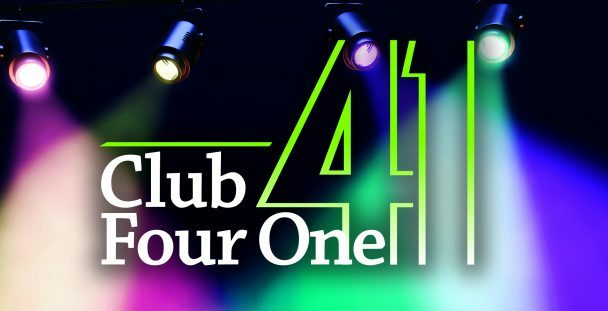 Stop in for Comedy Nights at Club Four One this winter! 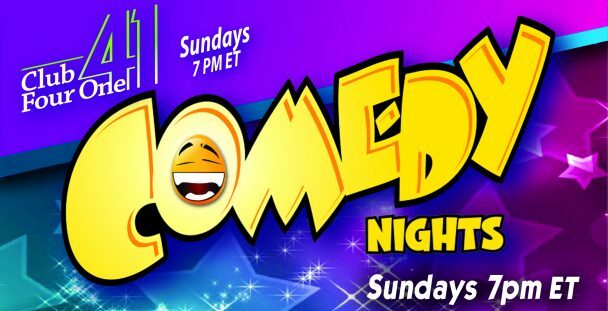 Bringing you comedians from all over the country, they’re here to make you laugh! Shows start at 7 PM ET. 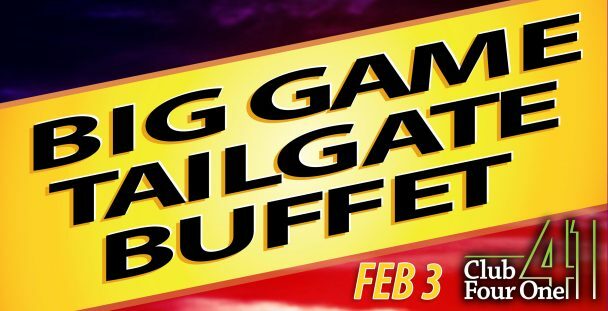 Feb 3 – Big Game Tailgate Buffet at Club Four One. See more info. Learn more about each comedian here. *Must be 18+ to enter Club 41. Must be 21+ to consume alcoholic beverages. All acts subject to change. Thank you to our veterans! We appreciate your service. 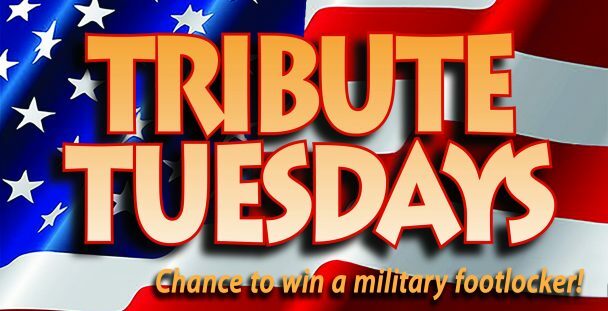 Please visit the Island Club to present your military ID and register to win our popular Relic Wood handcrafted footlocker customized with your branch of service. 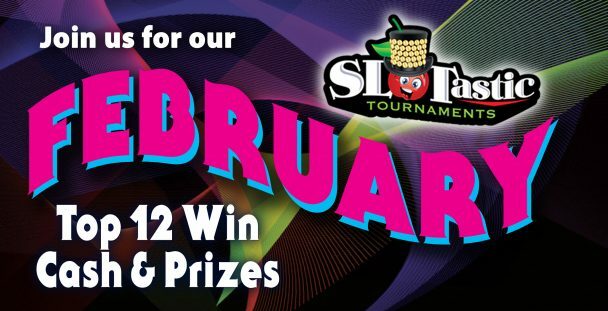 Join us for February slot tournaments! Top 12 win cash and prizes. 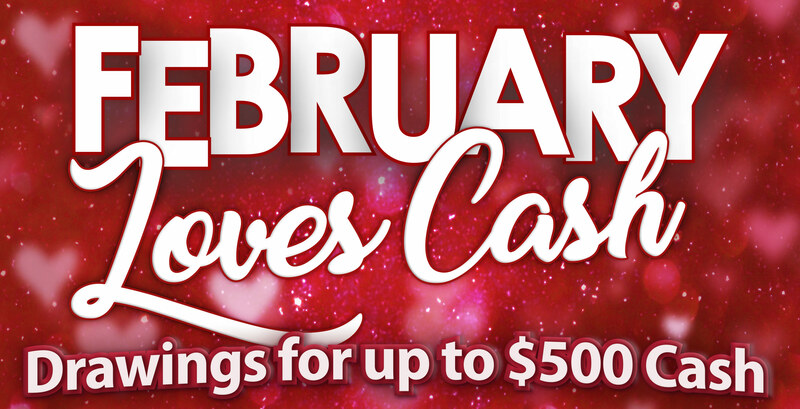 If your birthday is in February, visit any kiosk and receive a FREE $5 buy-in for any tournament during the month. Limited seats available for free birthday buy-in. *Tournaments are limited to 96 players and may be cancelled or changed at management’s direction. Team tournaments are played in teams of two. Every Wednesday, Island Club members 55+ visit any kiosk and receive an additional 10% off any meal at any of our six delicious dining experiences! 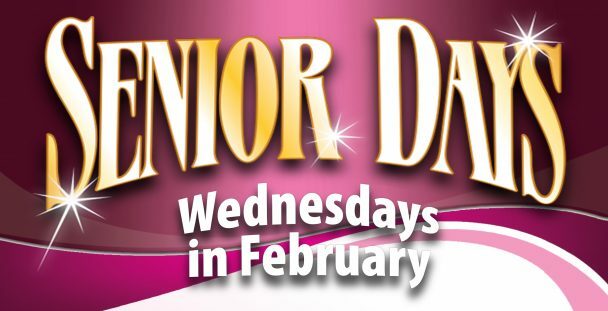 Don’t miss the FREE Senior Slot Tournament at 6 pm EST. *Discount can be used in conjunction with all other discounts, offers and coupons. Must be present picture ID at register. Promotions subject to change at management’s discretion. 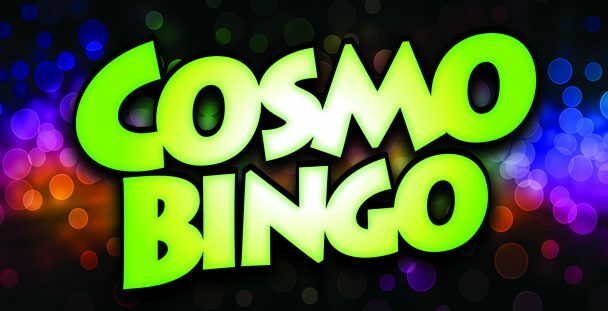 Enjoy Cosmo Bingo every Saturday! Approximately 11 pm EST. Following regular bingo. Keep up with us on social media to see what the winning prize will be! *Promotion subject to change at management’s discretion. Get your favorite 16 oz. 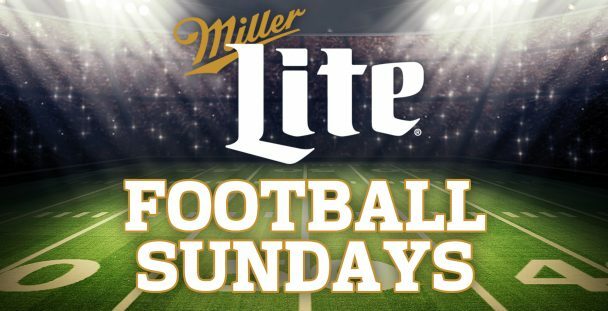 Miller Lite bottles for only $3.00 ALL DAY on Saturdays and Sundays and for the Big Game on Feb 3 too! Available at T. McC’s, 5 Bridges & Shakers. Tailgate buffet open to ALL patrons. Coupons and discounts not accepted. 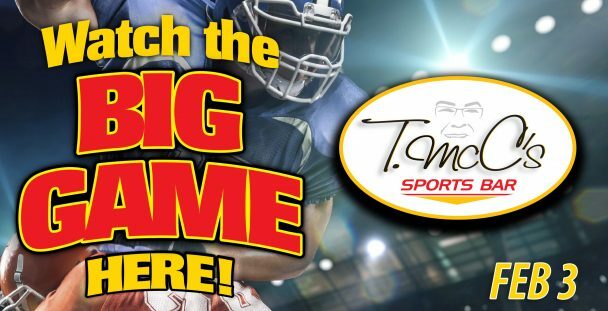 Watch the Big Game at your football headquarters, T McC’s Sports Bar on February 3. And drawings at Halftime for NFL Store Gift Cards! *Must be present to win. All drawings held at T McC’s Sports Bar. Promotion subject to change at management’s discretion. 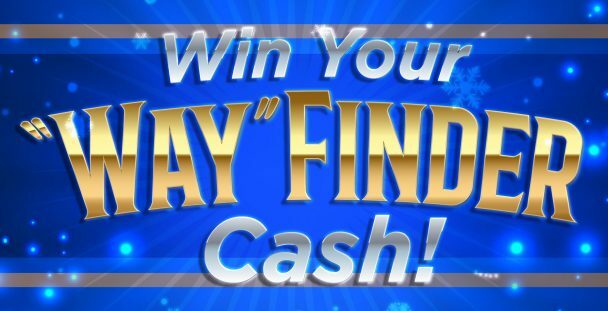 Want to win cash?! Just visit our Wayfinders located in the north entrance and hotel lobby to find the hidden icon. Tap it and complete the form to be registered for cash drawings every month! (5) $100 drawings each month. *Must have active phone number or Island Club number for valid entry. Must be 18+ to enter. Need not be present to win. Subject to change at management’s discretion. One entry per person per day.